“Standing Up” is a fine family film worth checking out. There are so few live action family movies anymore that I feel obligated to champion the ones that do get made, no matter how good they are. Fortunately, Standing Up is a well done little film with excellent acting by its stars and strong direction from veteran filmmaker, DJ Caruso. Based on the book, The Goats, by Brock Cole, Standing Up is set in the early 80s, which explains the ridiculously huge glasses the main characters are stuck wearing. Grace (Annalise Basso) and Howie (Chandler Canterbury) are a couple of outcasts at a summer camp who get tricked into joining a late night trip to a secluded island. Their fellow camp members promptly bully them, stripping them of all their clothes and leaving them to fend for themselves. These two junior high kids find each other in a deserted cabin with nothing but a blanket and a candle to make it through the night. Howie isn’t your average victim, though. As we gradually learn, he’s had an unfortunate childhood that makes him tougher than the jerks that ditched him. When the cruel boys and girls from the summer camp return to further humiliate Howie and Grace, Howie suggests that they swim off the island, leaving their tormentors to worry about what happened to the two “goats” they left behind. With great trepidation, Grace agrees to join Howie and together they set of on an adventure that changes their lives. Through a series of episodes that finds the unlikely heroes swiping clothes for themselves, scrounging for food and money, and falling in with a different summer camp where the kids are actually kind and inviting, Howie learns to trust someone and open his heart, while Grace gains confidence and pride in herself. Although Grace and Howard walk backcountry roads and adults frantically search for them (including Grace’s overworked single mother, portrayed by Radha Mitchell), you never get any sense that they’re in real danger. That is, until Val Kilmer’s deputy sheriff appears. Kilmer takes the role a little too far into creepy territory. 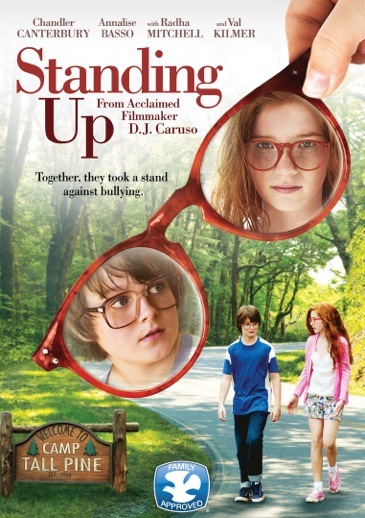 Unlike so many recent YA films, Standing Up doesn’t take place in a dystopian future or feature supernatural elements. This film is grounded in reality, a feat accomplished thanks to the honest performances of Basso and Canterbury, as well as the strong direction from Caruso (who also wrote the screenplay adaptation). Caruso captures the fear and anguish of childhood, as well as the awkward sexual tension that occurs in the early years of adolescence. If Caruso’s name sounds familiar, it’s because he directed the hit films Disturbia and Eagle Eye, as well as high profile projects starring Angelina Jolie, Ethan Hawke, Matthew McConaughey and Al Pacino. With his credentials, it’s a bit of a shock to find his name behind the scenes of a straight to video release. Standing Up received a VERY limited theatrical release (I believe it played in one theater her in L.A.) and is already on the shelves at Wal-Mart. Caruso has already lined up his next picture and the actors have moved on, so there’s a chance that Standing Up could soon be forgotten. It shouldn’t be. Although it isn’t about super heroes and may not be an animated film, Standing Up deserves to be seen. This is one film I don’t feel obligated to tell you about. It’s a wonderful indie film that I highly recommend.